Tricky to put together and fell apart pretty quickly. This is a good size but it's very flimsy. It’s good . Not bad for the price it’s available. 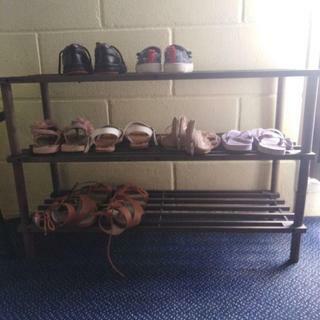 Awesome shoe rack for cheap! We're very happy with this shoe rack. It fits perfectly within our budget, was easy to assemble, and keeps our shoes off the floor and neat and tidy. Thanks Warehouse, you rock. This looks great and perfect for a shoe rack..but not for rough kids! nice little shelf though which is what im using mine for..wont hold anything heavy. Love mine. Had it for over a year. Yes its light ( possibly balsa wood ) but as long as you don’t sit on it its perfect. Very poor quality. fragile and thin. only lasted a few months. Very fragile. Does the job if you by no means accidentally bump it. Would not recommend if you have children. It will break. Was broken within a few hours of putting it up. I was going to buy one of these, but after I saw what they really looked like I decided to spend a little more and get a decent one. They are rubbish the woods all splintered and poor quality. Took a while to put together. The quality of the wood is very poor. It's like a dry flaky consistency, very flimsy. I recommend buying a different one. Very flimsy and not strong. Such bad quality! Sure a bit flimsy but if you aren't rough it's all good! Had for many months and many houses and it's still intact. Looks cool too! Poor quality quite flimsy design. Also badly manufactured, if you slightly over tighten the dowels, the inset nut starts spinning. This is a good shoe rack!